Growing up, I wasn't really into hockey, which is odd for a kid from a hockey obsessed town like Toronto. I was disinterested in it because I was (and am) a terrible skater. But baseball? Baseball I loved. After all, I was nine and ten years old when the Jays won their World Series, it was before the strike season, and dammit, I was good at baseball. My favourite player was, easily, Ken Griffey Jr. He was classy but competitive, and tall and thin just like me. I used to stand in my driveway and practice swinging my bat, trying to emulate his swing. I now realize that I could not have chosen a better role model for my swing. It's picture perfect: full of grace and power, efficiently slicing through the air. Griffey's swing can put the ball anywhere on the field, or, if he chooses, past the outfield fences. 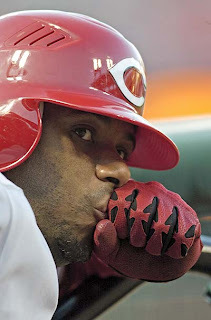 That's why I was saddened to read Tim Brown's article on Griffey and the Silent 600, which highlights something that I had also noticed: although Ken Griffey Jr. is approaching the impressive milestone of 600 career home runs, there is little fanfare or media coverage. Even the hometown Reds fans aren't excited about this milestone. Of all the home run hitters in the modern era, he, along with Frank Thomas, are some of the few to have escaped without getting caught up in the steroid madness. Griffey's body doesn't fit the stereotypical HGHers mold, and there is no doubt that a lot of his success comes from the sweetness of his swing, not of a syringe. For me, the defining moment of Griffey's career wasn't on the field, but instead at the end of his tenure with the Mariners. His teammate Alex Rodriguez had signed on with the Texas Rangers for the largest baseball contract of all time, and the New York Yankees were approaching Griffey with a similarly bloated offer. Instead, he chose to go to his hometown Cincinnati Reds for considerably less. Although this did nothing to stem the tide of outrageous contracts in the late 1990s, I still admired Griffey's priorities. Similarly, Griffey is an iconoclast today. A man who's reached a milestone through all natural means, but gets no attention for it, unlike last years cavalcade of shame while Barry Bonds approached the all-time record. Ultimately, I think this is going to be the aftermath of the post-strike steroid era. The public's trust has been broken, and the honest, hard working and clean ball players will suffer because they don't get the credit they deserve, while the puffed up home run heroes like Jason Giambi attract all the media coverage for apologies where they do not actually say what they're apologizing for. But for me, I still have my Reds cap, and my Ken Griffey Jr. unauthorized biography comic book, and I can't wait for him to hit his 600th homerun and truly earn his way into Baseball Hall of Fame in Cooperstown, because he was, and is, one of my baseball heroes.